Landfills and buried wastes pose a challenge for property owners, banks, and other commercial entities. A landfill is a site for the disposal of waste materials by burying them in the ground. Buried waste is also material that has been disposed of in the ground but is not as large or regulated as a landfill. 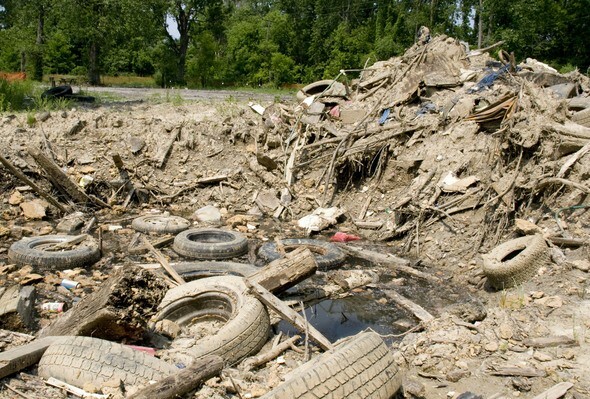 A good portion of waste materials can break down in the ground but some can be harmful. In the old days, wastes were simply dumped into pits or ravines or pushed down slopes and buried. The buried waste is still there…waiting to tell its story for a second time. On your dime. Landfills and buried waste are generally confined to as small an area as possible and then compacted to reduce the volume the waste occupies. In landfills the waste is generally covered with layers of soil to break up the volume and to allow the decomposition and break down of materials. With both landfills and buried waste the waste may contain hazardous materials that were not meant to be interred in the earth. These can include lead, petroleum products and heavy metals. When these hazardous materials leech into the groundwater they can cause both environmental damage and can contaminate drinking water. They can also kill vegetation and cause erosion on the property. Hazardous materials should not be put into landfills or buried in the ground.